With so many deadlines looming, I won’t be able to contribute to the Brown Bookshelf blog as much as I’d like to. So instead, I’ve invited a few authors and illustrators to sit in as guests, to discuss their recent projects. R. Gregory Christie is a three-time Coretta Scott King honor recipient. He’s illustrated numerous picture books, including the biographies of many significant historical and cultural figures — Richard Wright, Langston Hughes, Sojourner Truth, Muhammad Ali, Louis Armstrong, to name a few. 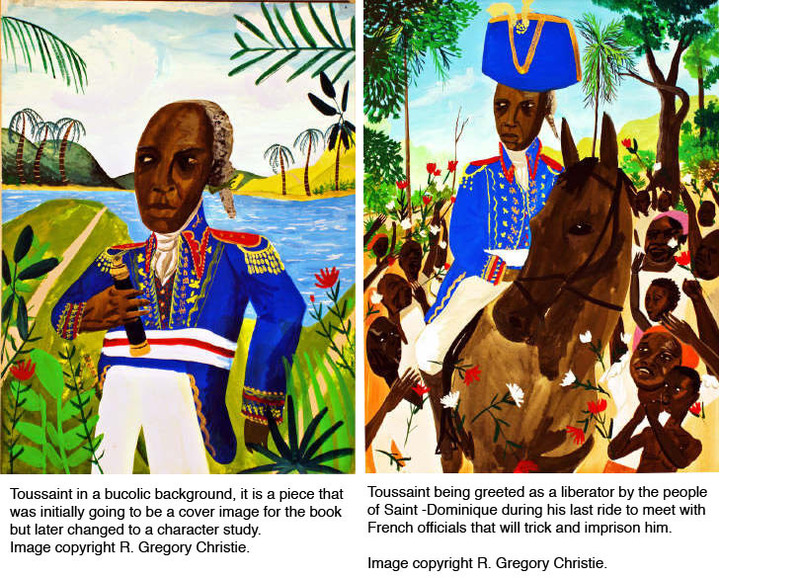 With his current picture book, Open the Door to Liberty!, written by Anne Rockwell, he illustrates the story of Toussaint L’Ouverture. I love it when authors and illustrators tell the stories of little-known historical figures. My interest in creating the art for Open the Door to Liberty! : A Biography of Toussaint L’Ouverture came from a desire to shed some light on such an important figure in American history. For me he seems to have been forgotten and never before in documented time were slaves able to rebel against their oppressors, gain their freedom and successfully start a nation. The story is remarkable one that Anne Rockwell, Houghton Mifflin and I were drawn to tell. I often enjoy doing historical projects because I think that it’s an interesting way to compile dates and occurrences. Picture books based upon historical events can be a perfect summation of achievements, dramas, dynamics and facts. Additionally, Young Adult Novels often deal with difficult topics but keep an engaging pace. This book is a hybrid of a picture book and young adult novel; it tells a story that should be known by any person that wishes to know more about the United States’ origins. Open the Door to Liberty! : A Biography of Toussaint L’Ouverture has information about the Haitian, French and American revolutions and explains how they are connected. 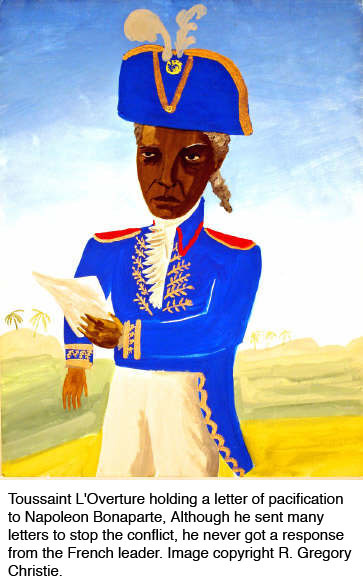 Even before creating the art for this book I brought up Toussaint’s name constantly because I often found that many grammar school pupils renowned Washington but not L’Ouverture. They knew about Dr. Martin Luther King but not Malcolm X, Harriet Tubman but not Sojourner Truth, the accomplishments of Edison but not Carver or Latimer. Furthermore, High school students didn’t know these people and I found that students were expected to read Uncle Tom’s Cabin but not Narrative of the Life of Frederick Douglass. Something just feels shameful and unbalanced to me about that, so I tend to put out historical facts in my interviews and see myself as a visual griot, I tell stories of our ancestors no matter what ethnicity they originate from, but in all honesty I have a special place in my heart for deceased brown people that often are forgotten by living brown people. I want to help people reevaluate the accomplishments of historical figures whose acquired goals have become a phrase rather than a honored concept. This book about Haitian, American and French History has the same catalyst that all my historical books do. I want to bring balance in people’s mentalities. If one knows about one hero (even an antihero), then I would hope that one will use a book similar Open the Door to Liberty! : A Biography of Toussaint L’Ouverture as a means to know that historical figure’s many ethnic counterparts. The book came about over a conversation with Anne while we were speaking about history as we often used to do. 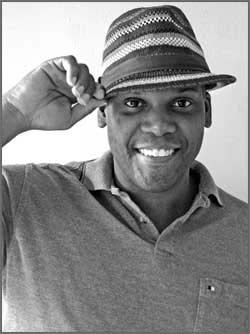 I asked “Have You ever heard of Toussaint L’Ouverture and from there it began; pitching the book to editors that had never heard of him, getting rejected here and there until the wise folks at Houghton Mifflin agreed to give it a shot. Everyone involved with the book was very patient and encouraging as the book developed. It was very hard to give Toussaint the right visual demeanor, there are not many images of him done in his life time and most of the later portraits are pretty stoic or seemed to be an artist’s own interpretation of him based from the famous profile etching where he is in his military regalia. So I had to find my own visual path which took a long time, I also had to give Haiti’s now long gone lush landscape a visual voice as I described the brutality of jungle warfare in a honest and child friendly way. The end result is this unique book with vibrant colors, idyllic landscapes and my best attempt at the time to do the man and his achievements some justice. In my opinion the information in the text is expertly relayed by Anne Rockwell because the important dates and places are there but not overwhelming within the text. I’m thankful that Houghton Mifflin was willing to give the telling of this story a chance, not every publisher was up for that. I hope that everyone gets an opportunity to see this book and after understanding the dynamics of the Haitian revolution leading to the encompassing of over 828,000 square miles in the US, tells everyone they know about such a powerful story. Compiled by Don Tate, illustrator and author of numerous books for kids, including Ron’s Big Mission (Dutton, 2009), I Am My Grandpa’s Enkelin (Paraclete, 2008), Sure As Sunrise (Houghton Mifflin, 2004), Summer Sun Risin’ (Lee & Low Books, 2005). Don has three forthcoming titles, which will publish with HarperCollins, Charlesbridge and Lee & Low Books.